You must have notice that my interest in design is increasing. As a part of this I have come across some excellent stuff on design and how it affects our lives. In todays round up I will give a preview of some of the sites from where I pick up my food for design thoughts. This I will do by taking you through one post on these sites, what I liked about it and what you can expect from it. Today I will talk about two sites which I visit regularly. Design Matters: I don't have a great feeling for corporate blogs.One advantage of being a corporate blog is their is no adsense clutter which most if not all of the personal blogs (including this) suffer from. But this one is different and rates high on my must read blogs. Very nice friendly layout, which lets you stay on their page and read through the content. I must give it 10/10 for the to the point, precise navigations and of course the content. 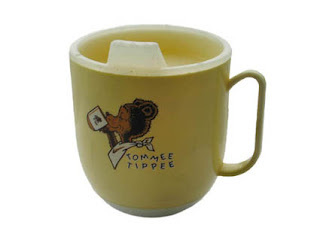 Check their latest post on "Tommee Tippee Cup", all of us agree that it's a great design that had proved its worth over decades. Check the categories for picking a post of your interest. I hope you have a great time with them. Tutorial Blog: This is the second blog for this design roundup. This site is one of the immensely useful sites I have seen in the area of web design. It was started to Photoshop tutorials on various techniques and effects. It has lot of resources which come in handy for web designers. Also posts like 30 Orange Websites, 30 Yellow Websites, give you a good look at different themes and how they were employed in various websites. Yesterdays tutorial on 10 websites with curves is another such example. Apart from this you can find links to lot of resources like free css templates, tutorials and so on. Checkout their categories for posts on a wide range of topics which aid making a good job at designing web sites. Ok, so we have seen DesignMatters and Tutorial Blog today.I am sure you will have a great time with them. 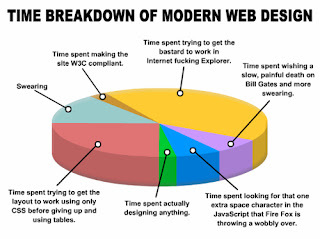 Finally before leaving the page take a look at the pie chart, you sure can identify with it. Will come up with more stuff in the next Friday Roundup.